Register for this Exclusive Webinar to Discuss the success criteria which impact the Mobile Transformation ROI. If you already have a strategy and are on the journey, understand the key metrics for timely review. We shall also discuss how some leading enterprises have achieved their mobility goals. 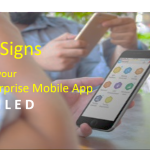 This Webinar is for: CIOs, IT Leaders, Mobility Transformation Leaders, Mobile Application Leaders & like. P.S. Can’t attend live? Still register, we shall be sending the recording & slides to all the registrants.